RED HEART® “Super Saver®”: 12 skeins 313 Aran. Crochet Hook: 4mm [US G-6]. Size: Throw measures 50” x 72”. GAUGE: 12 sts = 4”; 8 rows = 4” in dc. CHECK YOUR GAUGE. Use any size hook to obtain the gauge. PC (popcorn) = work 5 dc in st, remove hook from loop, insert hook from front to back in first of these 5 dc, pick up dropped loop and draw through st, ch 1 to tighten (does not count as a st). RPC (reverse popcorn) = work 5 dc in st, remove hook from loop, insert hook from back to front in first of these 5 dc, pick up dropped loop and draw through st, ch 1 to tighten (does not count as a st). FCT (front crossed treble; worked over 4 sts) = skip next 2 sts, tr in next 2 sts, working in front of these sts, tr in the last 2 skipped sts. BCT (back crossed treble; worked over 4 sts) = skip next 2 sts, tr in next 2 sts, working behind these sts, tr in the last 2 skipped sts. Row 1 (Right Side): Skip next 3 sts, tr in next st, working behind this tr, dc in the 3 skipped sts. Row 2: Skip next 3 sts, tr in next st, working in front of this tr, dc in the 3 skipped sts. Repeat Rows 1 and 2 for ZZ Pattern. Row 1 (Right Side): Dc in next 3 sts, PC in next st, dc in next 3 sts. Row 2: Dc in next 2 sts, RPC in next st, dc in next st, RPC in next st, dc in next 2 sts. Row 4: Dc in next 3 sts, RPC in next st, dc in next 3 sts. Row 5: Dc in next 2 sts, PC in next st, dc in next st, PC in next st, dc in next 2 sts. Row 6: Repeat Row 4. Repeat Rows 1-6 for PC Panel. Row 1 (Right Side): Dc in next 6 sts, BCT, FCT, dc in next 6 sts. Rows 2 and 5: Dc in next 4 sts, FCT, dc in next 4 sts, BCT, dc in next 4 sts. Rows 3 and 4: Dc in next 2 sts, BCT, dc in next 8 sts, FCT, dc in next 2 sts. Row 6: Repeat Row 1. Repeat Rows 1-6 for Diamond Panel. Foundation Row: Sc in 2nd ch from hook and in each ch across; turn – 203 sc. Row 1 (Right Side): Ch 3, skip first sc, dc in next 3 sc, [ch 1, skip 1 sc, FCT, ch 1, skip 1 sc, PC Panel Row 1] twice, * ch 1, skip 1 sc, FCT, ch 1, skip 1 sc, dc in next 2 sc, [ZZ Pattern Row 1] 4 times, Diamond Panel Row 1, [ZZ Pattern Row 1] 4 times, dc in next 2 sc, ch 1, skip 1 sc, FCT, ch 1, skip 1 sc, PC Panel Row 1; repeat from * once more; ch 1, skip 1 sc, FCT, ch 1, skip 1 sc, PC Panel Row 1, ch 1, skip 1 sc, FCT, ch 1, skip 1 sc, dc in last 4 sc; turn. Row 2 (Wrong Side): Ch 3, skip first dc, dc in next 3 dc, [ch 1, FCT, ch 1, PC Panel Row 2] twice, * ch 1, FCT, ch 1, dc in next 2 dc, [ZZ Pattern Row 2] 4 times, Diamond Panel Row 2, [ZZ Pattern Row 2] 4 times, dc in next 2 dc, ch 1, FCT, ch 1, PC Panel Row 2; repeat from * once more; ch 1, FCT, ch 1, PC Panel Row 2, ch 1, FCT, ch 1, dc in next 3 dc, dc in top of ch-3; turn.Continue in this manner, working appropriate rows of patterns and panels until 71” from beginning, end by working Diamond Panel Row 6. Ch 1, work sc evenly around and work 3 sc in each corner; join with a slip st in first sc. Fasten off. Weave in ends. Cut 14” strands of yarn. 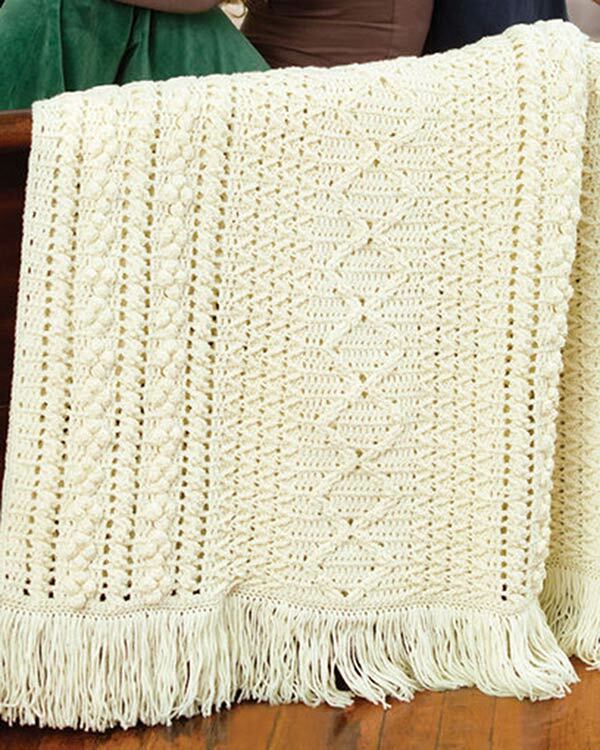 Holding 2 strands together, knot fringe across each short end of throw as follows: fold strands in half forming a loop; insert the crochet hook through the fabric from the wrong side and draw the loop through, then draw the yarn ends through the loop and tighten. Trim yarn ends. 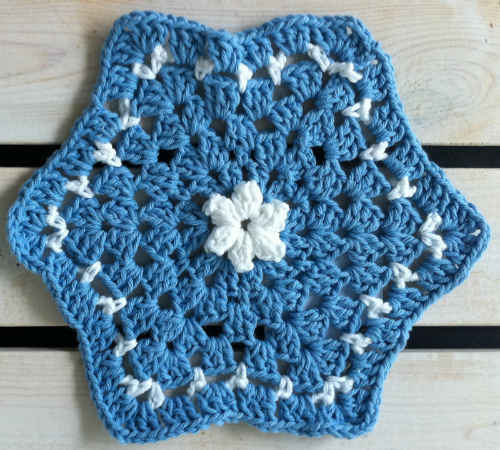 ABBREVIATIONS: ch = chain; dc = double crochet; mm = millimeters; sc = single crochet; st(s) = stitch(es); tr = treble crochet; * = repeat whatever follows the * as indicated; [ ] = work directions in brackets the number of times specified.